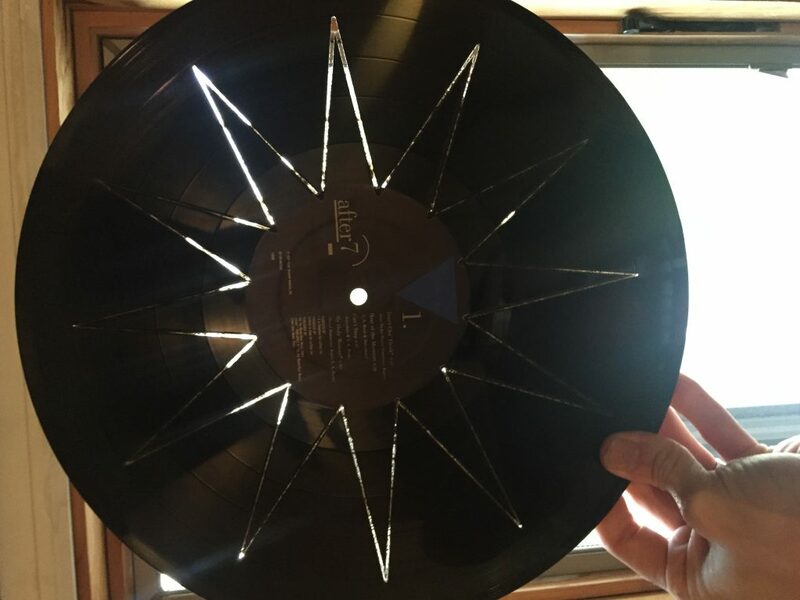 A few KNK customers have been curious about whether their machines could be used to cut a record, the other kind of vinyl, so I decided to try and wanted to share the results. Anytime I cut plastic, wood, or any other potentially messy material I like to use what I call a “trash mat” and it just so happens that Amazon has a 2 pack of Cricut mats on sale for $7.19! I usually clean my mats weekly, but sometimes I have a particularly messy week so it’s always helpful to have some spare mats kicking around. Find an old record that you’ll never want to listen to again. If your vinyl is precious, head off to your local Goodwill or other thrift store and pick one up. You can usually find them for $1 or less. You’ll need the KNK Rotary Tool and an appropriate cutting bit, such as this one. As you’ll see in the video, small pieces of your record will be ejected so please be sure to wear protective eyewear. The ones linked are less than $3 and also fit over most prescription eyewear. Be careful! 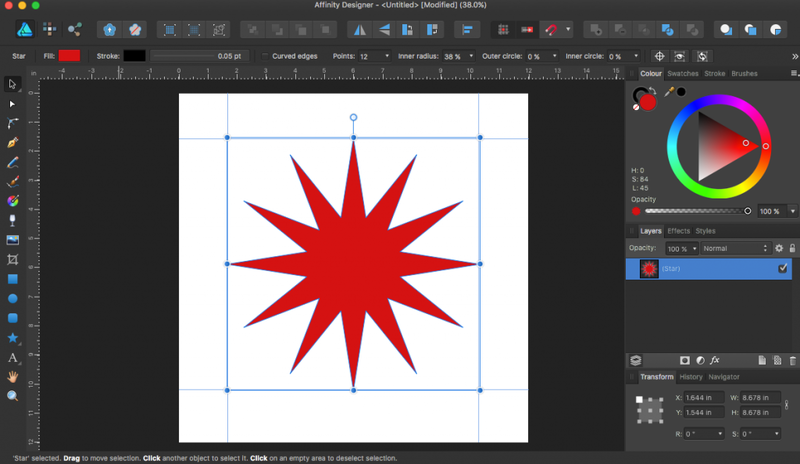 I used the awesome shape tools in Affinity Designer to create a 12 pointed star. I decided on that shape because I considered inserting a clock mechanism in the center and hoped it might line up properly. 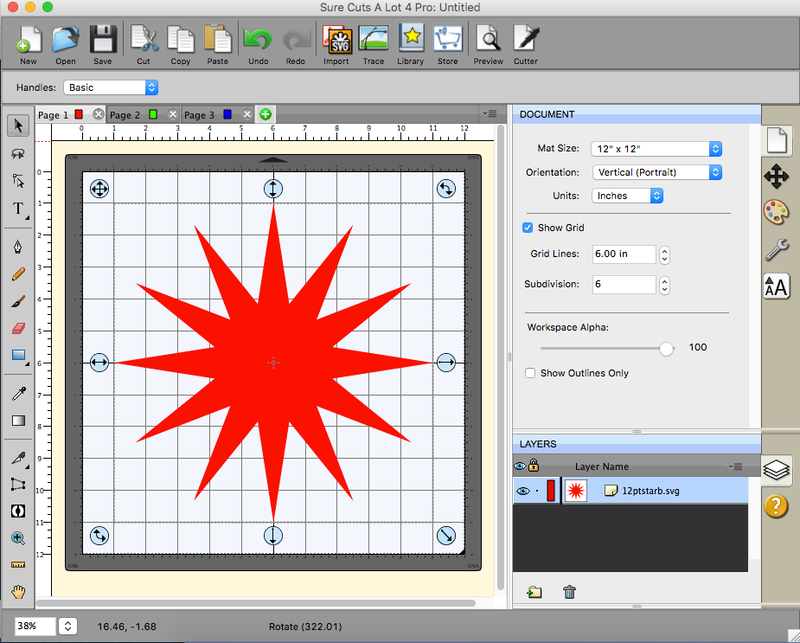 In hindsight, I should have rounded the corners because I ultimately created a large Chinese throwing star. I exported the SVG from Affinity and imported it in to Sure Cuts A Lot so I could take advantage of the WYSIWYG cutting mode and line things up a bit better. 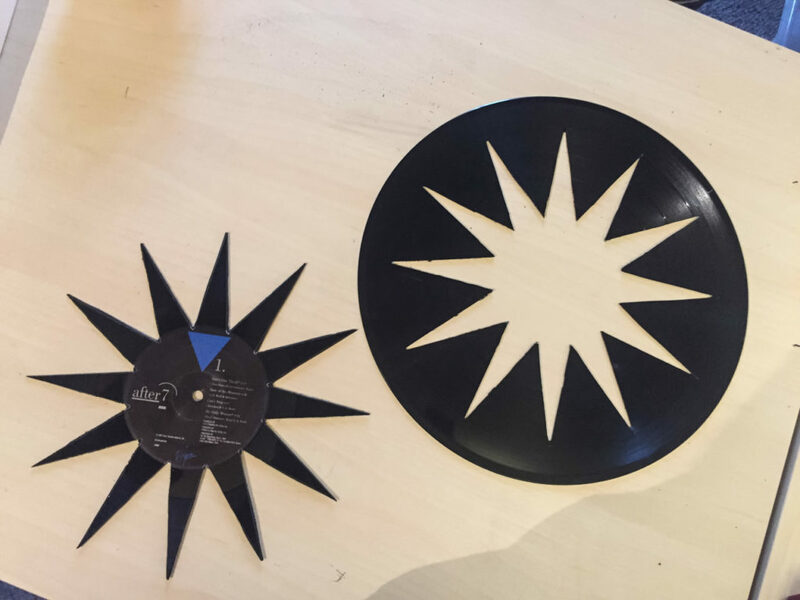 I used a digital caliper to measure the thickness of my record and realized it wasn’t uniform, so I used the lowest measurement in the Rotary Calculator to determine an approximate cutting depth. In hindsight, I could have placed a thin piece of wood or acrylic between the mat and record to give some additional cutting clearance which would have negated the need to do some finishing work described later in this article. I centered the record on my cutting mat, put the soft-rubber roller in my brayer, and made several passes over it. I then used some shipping tape to help ensure it didn’t move during cutting. I inserted the mat in to the Force, allowing two of the rollers to catch the edges of the mat and let the center roller down on top of the record. Next, I began the “replace tool” process and inserted the rotary tool and adapter in to the left tool holder and set the z-origin with the bit on top of my material. I set my origin point with the bit at the bottom-right corner of my mat. Look at your bit head on to ensure it’s aligned with the right-edge and horizontally to ensure alignment with the bottom edge. For settings, I initially used multiple passes, but quickly learned that the material removed from the record gets caught on the bit and decreases cutting efficiency. I suggest doing single passes, stopping the rotary, removing any material that’s gathered around the bit, then continuing on with your next pass. You shouldn’t have to remove the rotary for this, just use some tweezers or whatever you’ve got handy and clean off the bit. 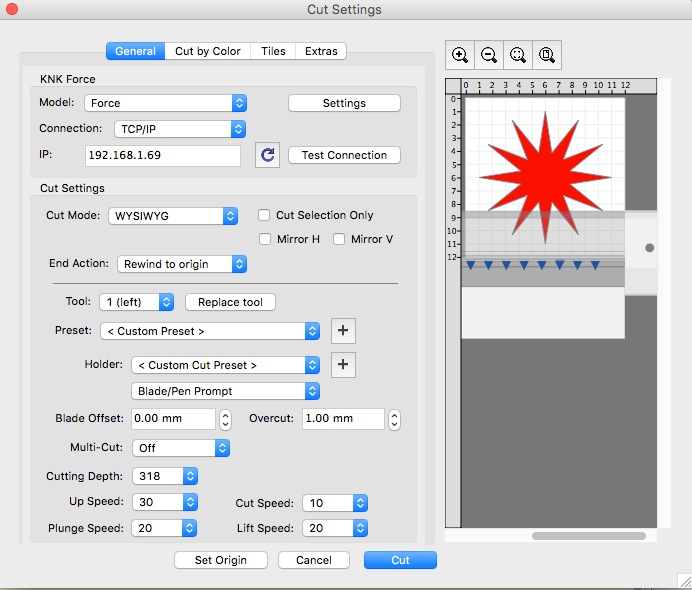 Make sure you have the “rewind to origin” set so any subsequent passes cut in the same location. I used a cut speed of 10 because I always like to take it slow to get a good cut, not stress the bit or the material, and just to be generally cautious. As records vary in thickness, my cutting depth setting will not match yours. Use the rotary calculator and monitor your passes. If your bit isn’t removing material efficiently and you see the tool carriage rocking or hear the motor straining, chances are you either need to take it slower, use narrower increments of cutting depth between passes, or possibly even a different bit. 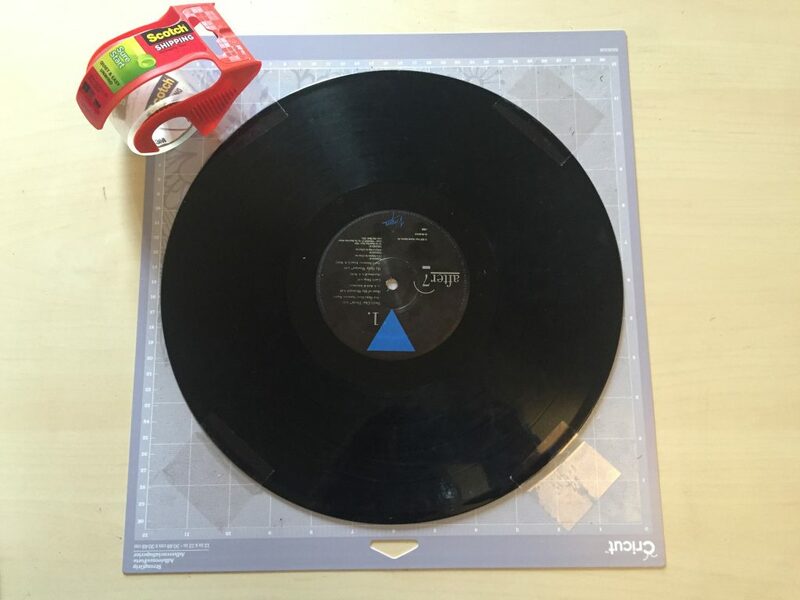 As I mentioned before, had I placed an additional layer of material between the mat and the record, I could have kept going and cut in to the middle layer until my record was fully cut. I didn’t do that, so I chose to stop here. I finished the cuts using a rotary cutter on the long lines and a craft knife on the corners. Since nearly all the cuts were almost complete, it didn’t take much effort. I finished it off by filing the edges (not with any precision, mind you) that I cut as the ones the rotary was able to complete were fine. Again, had I had that middle layer and cut completely, any finishing work would have been minimized. And just in case you’re wondering what this record used to sound like, here’s a video of the most well-known track from it. Enjoy! Great Work! Would the Force be able to cut the record album with a deep cut blade also? With the idea that more intricate cuts could be done. I would think that multiple cuts would be needed, and a through away mat also. Thanks! I don’t think the deep cut blade would work very well on such a dense material. I think some more intricate designs could be possible with the rotary tool, though. Let me get through my project queue and maybe try something with more curves and flourish and see how that goes! Will the force cut engraving stock? If so can you do a video on cutting engraving stock. I am beginner in the cutter machine equipment, and I got the KNK Force to be able use the rotary tools, please let me know where I can get the adapter to connect the Force and the rotary tool. Hi Antonio! You have to call KNK to order the rotary tool. It’s a kit that comes with the adapter included, an external control box (which helps keep it light), and a small assortment of drill and cutting bits.